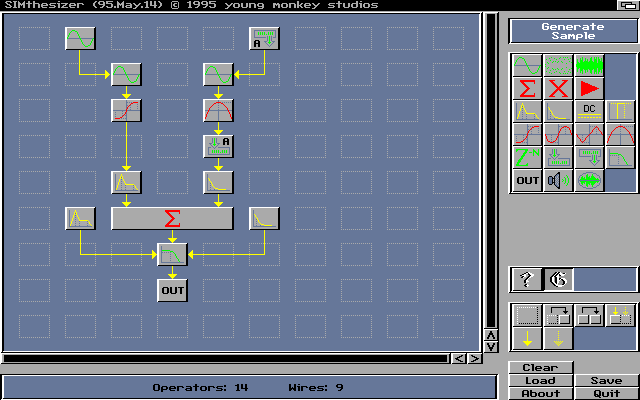 SIMthesizer was developed in 1995 for the Amiga computer, but never released publicly. It was a waveform generator/modifier that combined multiple synthesis technologies, including: analog, digital, wavetable, additive, subtractive, granular, frequency modulation, phase modulation, wave shaping, phonetic speech, Ghunöga, Re-Haus and more. As well as generating new sounds, SIMthesizer's extensive waveform modification features could be used to enhance existing sound sample data. The SIMthesizer design engine was very intuitive and could be easily understood by both novices and experts. Multiple components, called Elements, were arranged on a grid and joined together as SIMths. Commonly used element configurations could be combined as macro elements, called Modules. The simplicity of SIMthesizer made it an ideal educational tool, as well. Beginning with as few as 2 elements (Sound Source element + Output element) waveforms could be generated and visually/audibly studied. As the sound designer gained an understanding of audio basics, new elements could be added to create enhanced and more complex sound structures. Hardware components used in early analog synthesizers often colored sounds with parasitic variations. Though sometimes unwanted, these variations could be used to enhance sounds. Used properly, "thicker" and uncontrolled/unexpected, but desirable, harmonic content can be generated. Newer digital technologies typically did not capture the element of surprise like the good old days: "ZAP! Sizzle! What happened. What it is doing. WOW! What a great sound!" Analog synthesizers contain some level of inherent noise, caused by parasitic imperfections in the electronic components. This noise is always present in the background and contributes to the instrument's signature sound. As more studios turn to full digital recording, engineers are sometimes finding it necessary to introduce noise into digital recordings to get a particular feel. Allowed the assignment of Parasitic parameters in several areas. This exciting feature provided the sound designer with the capability of creating subtle to extreme variations on built-in algorithms. Noise Signature Profiles of various manufacturer's products were selectable as controllable parameters. In keeping with our philosophy, every compiled copy of SIMthesizer had a different internal Parasitic factor. This ensured that sounds created on one copy of SIMthesizer would not sound exactly the same as on another. Where applicable, elements had extensive parameter and modulation capabilities. Noise: Color controlled parametric equalization where noise spectrum could be defined using an RGB palette selector. This feature provided the ability to create noise content other than the standard White/Pink. Modulation parameters: Pitch, symmetry, amplitude. Oscillocope, speaker, file, standard MIDI transfer. Fully controllable/programable Envelopes were available for modulation of Sound Sources, Wave Shapers, Filters and other Envelopes. Modulation parameters: amplitude. These functions provided a means to mix and modify sounds. Sum, multiply, average, gain, integration, differentiation, cross-fade. Multi-Element feedback registers allowed generated signals to modulate themselves and/or other element's parameters. Provided a means of emphasizing/suppressing harmonic content. 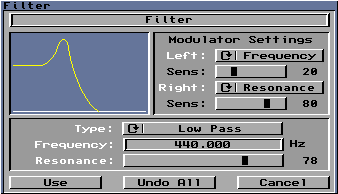 Modulation parameters: Cut-off frequency, resonance/Q. Low, high, band pass, notch reject, all pass. Allowed direct modification of waveform shape using algorithms based on gamma curves, parabolas, sinusoids, linearity, non-linearities (such as diodes) and arbitrary shapes. 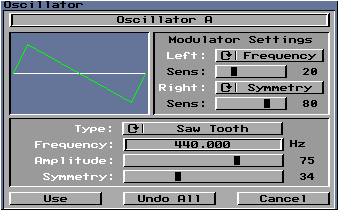 Modulation parameters: dependent on the shaping algorithm. Should there be any potential for clipping to occur at any point in the sound generation process, the Element icon, where clipping would occur, was highlighted and the sound designer could examine the waveform and consider modifications. Because SIMthesizer generated sounds in a higher resolution than the output waveform, clipping would not actually occur; but warnings would be generated to show elements where clipping could exist in the output waveform file. Format: Raw, IFF-8SVX, AIFF, NeXT, Sun, Wave, U-Law, A-Law, AVR, Mac, IRCAM, Voc, SampleVision, etc.